Gameguard was updated on Tuesday, September 4th. According to Sega, they have identified the source of the problem based on the reports everyone sent in. If you notice the problems continue, that is related to a different problem and is not covered by the update performed on Tuesday. So they ask that you send them an email just like before. Sega would like to collect data related to this problem in order to investigate the cause of this malfunction. Please kindly send this information outlined below. Compress all of these files into one file that takes up to 5MB of space. If the file size is larger you can also split up the files if you want to. Within the email write about the 「ご利用のセキュリティソフト」(Security Software) you use and the「不具合詳細」(Bugs) you’ve noted. This email is only used for collecting information about this GameGuard update and can not reply to any inquiries. 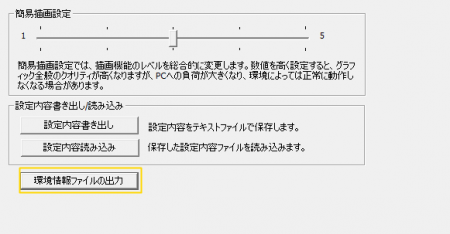 Press 環境情報ファイルの出力 to create a pso2_dxdiag.txt file. This file will be located in your Phantasy Star Online 2 (My Documents) folder. Your copy of Windows is no longer Genuine. Firefox freezing on pages that require Flash. Various essential Windows processes no longer responding.